Let me count the ways a river cruise surpasses an ocean cruise! First of all, we flat out say that a river cruise trip is not for everyone. That’s right. Not everyone will enjoy the many benefits that an affordable and luxurious river cruise can offer. If you fit the following profile, we think you should probably stick to a more traditional cruise ship. 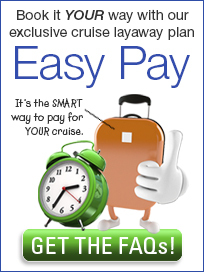 ◙ Paying extra for all your shore excursions which can be over $1000 per person. ◙ Paying extra for some of the onboard entertainment and venues. ◙ A large impersonal staff that think of you as “Tip” and never know your name. ◙ Being jammed on a ship with up to 5000 of your closest friend… and that’s only the passengers. ◙ Spending 2-3 hours getting on and off the ship each day in port. ◙ Driving over an hour from the port to the city center to begin your shore excursion. ◙ Never having enough time to truly get to see a port and mix with its people. ◙ Dining with 1000 people all trying to be served at the same time with assembly line food. ◙ Getting seasick when the seas are just a bit rough. ◙The disco at night… whee! Now, we don’t want to place too large of a cloud over traditional ocean cruising because the ocean cruise business is the genesis of where Premier River Cruises got its start back in the 1980s. An ocean cruise vacation does have many wonderful elements and is still the second best cruise vacation choice you can make. Today’s modern ocean-going ship has it all! You name it, your ship probably features it... rock-climbing walls, ice skating, up to 20 different dining venues for your enjoyment (most at an extra fee), and gorgeous accommodations with nice amenities (Oh, by the way, ocean passengers now pay for the movies they watch incabin!). Ocean ships are now more like a Vegas-style vacation than a cruise, but our main objection is… what ever happened to the all-inclusive nature of a cruise? It is dead and buried! Between outrageous taxes and fees to being charged for almost anything you do on the ship beyond taking a walk on deck, the cost of the cruise ticket is generally far less than your onboard expenses. That’s just not right. Period! Is this truly what you want your perfect vacation to be like? We don’t think so! We don’t encourage those under 40 to start with a river cruise (But many do! ), but for those of us who prefer to travel with smaller groups of like-minded people, see and experience a destination in depth, then an almost fully-inclusive — or, fully-inclusive — river cruise vacation is right for you. ◙ A very spacious river cruise ship that on average only accommodates 130 or so privileged guests. ◙ Sumptuous accommodations with every conceivable cabin amenity. ◙ Incredible gourmet cuisine, much of which is prepared àla minute [when you order it]. ◙ Complimentary wines, beers, sodas and bottled water. ◙ Complimentary small-group sightseeing excursions in EVERY port. ◙ Most ships have gym, sauna, massage, hairdresser, pool, FREE internet and free use of bicycles. ◙ Daily free onboard evening entertainment. ◙ Complimentary in-cabin Internet, entertainment systems with live U.S. TV, and free movies. ◙ Dock right in the center of most towns and it takes only one minute to get on/off the ship. ◙ Ability to see more of a region and experience the local culture in-depth. ◙ A resort-casual onboard atmosphere – leave the formal wear at home. ◙ All staterooms, repeat ALL rooms have a river view. ◙ You can NEVER get seasick on a river cruise ship. ◙ Impeccable, warm and friendly service by an English-only speaking crew. ◙ A staff that knows your name and favorite beverage by the second day. ◙ A lifetime of memories from the journey and the people you’ve met along the way. Of course, ocean going ships will take you to Rome, a river cruise ship will not (But, they will take you Venice... see Uniworld's delightful Venice and Gems of Northern Italy for a spectacular Venice itinerary!). Ocean cruise ships will go to places a river cruise cannot, simply because that place is not on a river — nothing more. But think about the world before we go beyond this point. Much, if not most, of the ancient world was developed alongside of a river because the rivers were the main source of commerce and easy to navigate. Therefore, places like Amsterdam, Vienna, Budapest, Rouen, Paris, Honfleur, Lyon, Strasbourg, Avignon, Prague, Belgrade, Moscow, St. Petersburg, Beijing, the Nile River, the Mekong River of Vietnam and more can only be reached by river ship! River ships truly afford you the opportunity to see more of the world, visiting intimate, ancient towns and villages that can never be reached by ocean going ships. In this article, we’ve covered just a few of the many reasons we feel that a luxurious and affordable river cruise vacation is the best choice for most people. Those are the ones who prefer not to be on a ship with up to 5000 of their closest non-friends; don’t want to pay extra for almost everything; want to enjoy the intimacy of a small ship with a hundred or so friendly, like-minded co-passengers; savor the “included” 5-star luxuries and amenities; dine on impeccable cuisine; and take full advantage of the many FREE shore excursions, surely will choose a river cruise vacation. Why not consider a France river cruise, a Danube or Rhine River cruise, an Eastern Europe river cruise or even a Cambodian river cruise on the Mekong River for your next vacation. 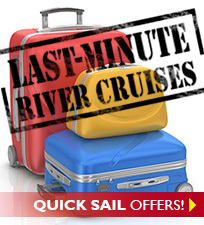 Take a look through our website and discover the many wonderful and affordable river cruise vacations we have to offer.